Over the weekend, Makuhari Messe in Tokyo (well, technically Chiba) hosted yet another event, that of Chara Hobby 2014. Prior to that Bandai announced a new line of toys called Metal Robot Damashii. We held off on mentioning the latter because we guessed (correctly) that the new toy line would be shown at Chara Hobby. 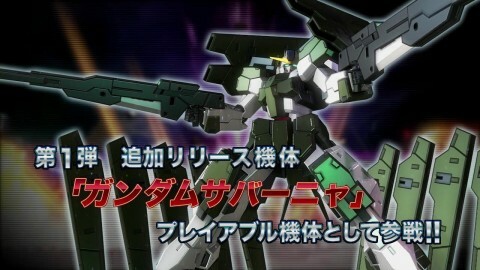 Well, it turns out the first figure in the new toy line will be the mighty RX-93-v2 Hi-Nu Gundam (pictured above). You may be thinking, didn’t they already release a Hi-Nu Gundam recently? The answer would be “yes” (we reviewed it too) but this has all manner of diecast in the joints and other detailing. Subsequently, it looks utterly glorious. No word on price point or release date as yet but we’ll let you know as soon as we do. 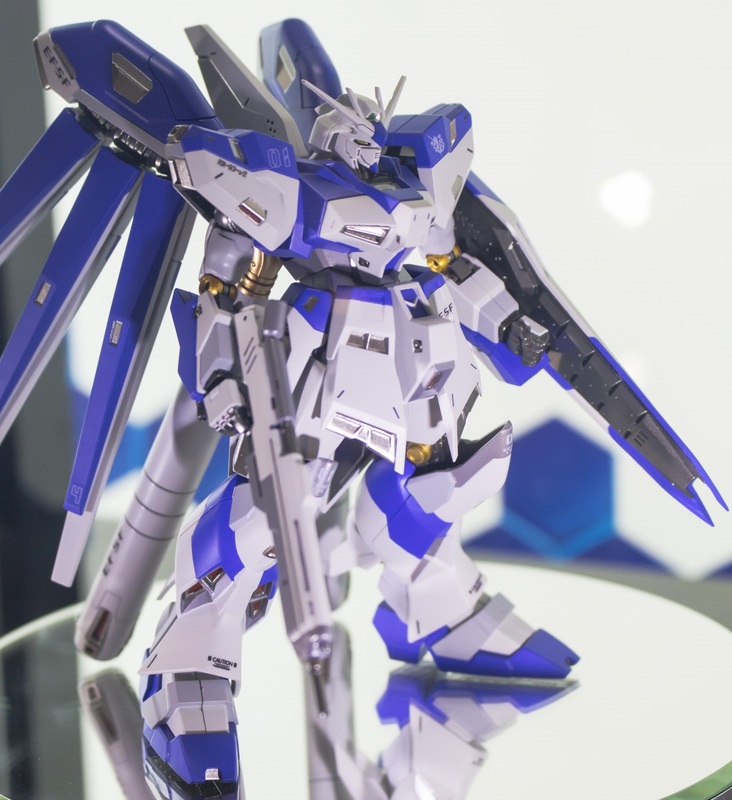 In the meantime check out the video of the new metal infused Hi-Nu Gundam below. As for the rest of Chara Hobby, there was a lot of cool stuff on show. From the eye wateringly expensive Soul of Chogokin Gaogaigar which is out in December, to the gorgeous Megahouse Orguss. Anyway, check out the coverage here, here, here, here and here. Following the announcement of an X2 toy, soon to be released in September, we now also have news of a new toy release. 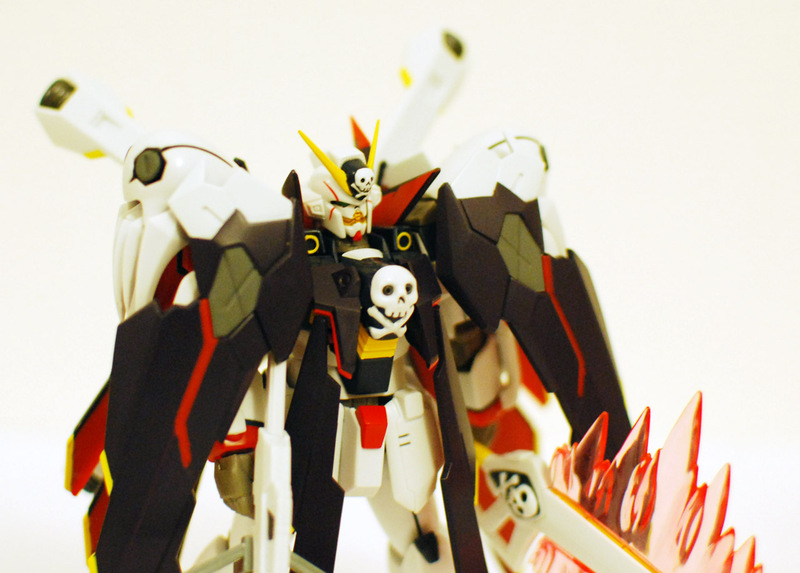 That of the plucky XM-X3 (F97) Crossbone Gundam X3. Unlike the X2, the X3 will be a webshop exclusive sadly. Priced at 5,616 yen and released in February next year, the pre-orders start today. There’s a definite push for more Crossbone Gundam toys though. As we had the Full Cloth, the X1 option parts set and even Harrison’s F-91 released or announced. 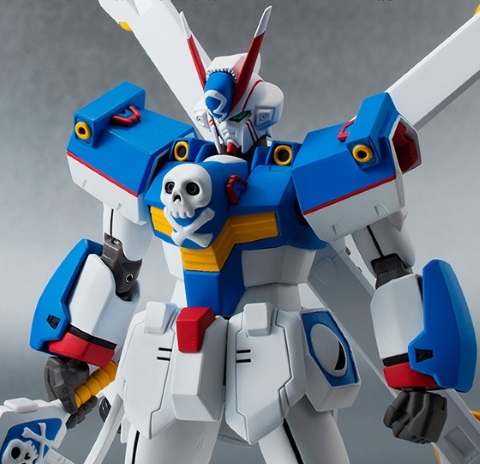 What’s weird about all this, is that we have already had several Robot Damashii toys released of the various Crossbone Gundam mobile suits (bar the Full Cloth) and those had the ABC mantles too. Anyway, updated releases or not we’re just happy to see more of those classic mobile suits get the Robot Damashii treatment. If only they’d do the decent thing and make an anime already. Dreadnought Gundam is on its way to the Gundam Extreme Versus Maxi Boost roster in July. Coming from the manga Gundam SEED X-Astray, the Dreadnought Gundam is piloted by Prayer Reverie, the rival of Canard Pars and the Hyperion Gundam. In game, it is another addition to the 2000 cost units. With its Dragoon attacks and Red Frame assists, it definitely looks to be a rather interesting suit to use within that cost bracket. I do wonder when Shining will eventually enter the fray as well, but hopefully we’ll be seeing it soon and many other fan favorites as well. Make sure to check out the gameplay trailer below to see Dreadnought Gundam in action! 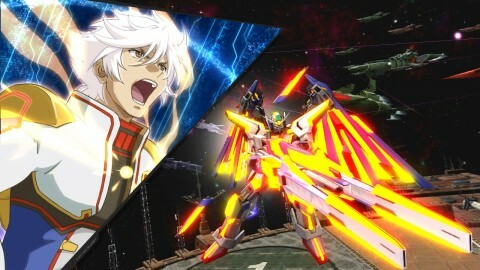 This month Bandai Namco will be adding three more units into the Gundam Extreme Versus Maxi Boost roster. They are Blitz Gundam, Johnny Ridden’s Zaku II, and Lacus’ Infinite Justice. 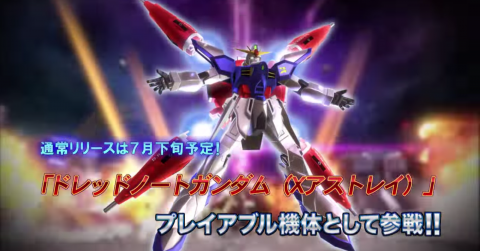 While we’ve seen Johnny Ridden’s Zaku II and Lacus’ Infinite Justice as Gundam Extreme Versus Full Boost DLC, Blitz Gundam has not seen playable action in the Versus series since Gundam Seed Destiny Plus. Armed with the Mirage Colloid cloaking effect that appears to act like Deathscythe Hell Custom’s stealth system and an Aegis assist, it looks to be a rather interesting addition to the already stacked roster as a melee oriented 2000 cost unit. So be sure to check out the announcement vids for the characters below! 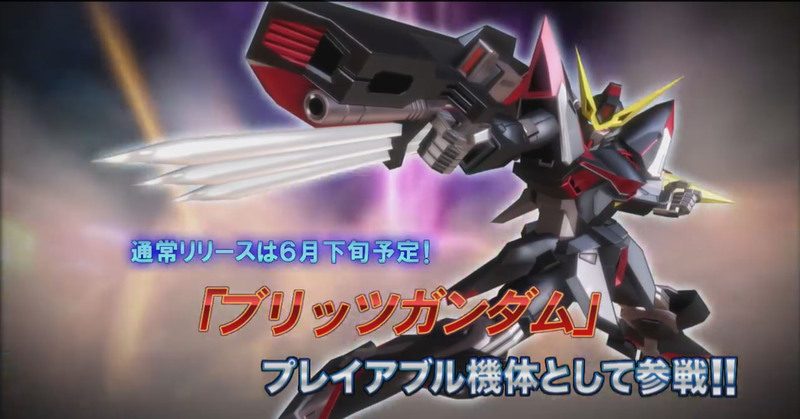 As we saw at Tamashii Nations recently, a Full Action Crossbone Gundam X2 is on the way. Released this September at 4,800 the figures looks to have had considerable work done on it compared to the original Robot Damashii release. The ABC mantle is noticeably absent however, though that might end up as an option set. Talking of option sets, the X1 Ka Kai we reviewed recently is getting an option set to match its setup as seen in the Skull Heart manga. In addition to the X2, we’re also getting a majestic God Gundam figure released at the same time and price. So it looks like September will be a costly month. Courtesy of our good friends at HobbyLink Japan, we’ve been sent a toy from the Mobile Suit Crossbone Gundam: Steel 7 manga to review. 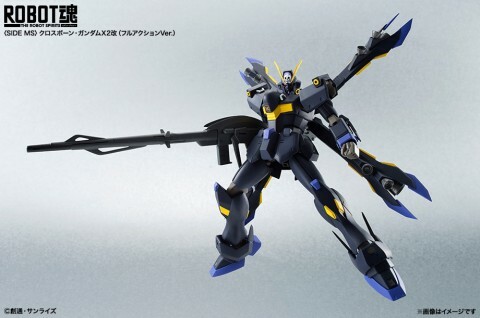 Specifically, the Robot Damashii Crossbone Gundam X1 Full Cloth that’s on sale. In addition, to give the toy some context, we’ve also linked gameplay footage of it in action at the end of the review. Spoilers ahoy! 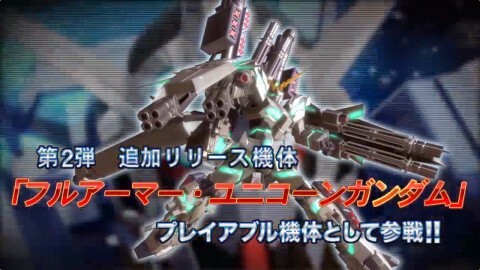 Looks like the Full Armor Unicorn Gundam will be the next mobile suit to join the Gundam Extreme Versus Maxi Boost roster in May. Coming in as a 3000 cost suit, the FA Unicorn will battle in three stages that visibly purge when moving onto the next. Each stage will of course have different armaments ranging from anti warship armaments to a bendable mega beam launcher. Since this is coming in before the release of episode 7 of Gundam Unicorn, there are other attacks in the video that I won’t mention if you are concerned with spoilers. If not, definitely check out the link below! Namco Bandai is bolstering the Gundam Extreme Versus Maxi Boost roster with another one of Lockon Stratos’ suits, Gundam Zabanya. Coming sometime in early April, Zabanya will be a 3000 cost unit for those looking for a high powered ranged suit to master. True to its nature as seen in the Gundam 00 movie “A wakening of the Trailblazer,” Zabanya is all lasers galore with its GN Pistol Bits firing all over the place and filling up the screen. It’ll be interesting to see how well the unit plays in the upcoming weeks in real match scenarios, but at the very least it looks like it will be fun annoying opponents with a constant beam barrage. Check out the video below! 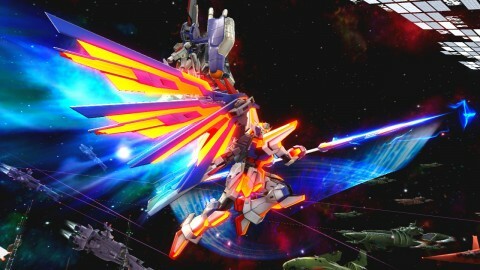 Gundam Extreme Versus Maxi Boost has been released in Japanese arcades today. 4gamer has provided a summary of the 14 newly added suits to the third iteration of the Extreme Versus franchise. The units added are Gundam AGE-1, Char’s Zaku II, Gundam (G Mecha), Puru’s Quebeley Mk-II, Perfect Strike Gundam, Gundam Avalanche Exia, Brave Commander Test Type, Gundam Extreme type-II Leos Valiant, ZZ Gundam, Legend Gundam, Hyperion Gundam, Astray Red Frame Kai, Penelope, and Gundam AGE-2. This of course will probably not be the last of the additions as 00 Gundam Seven Sword was teased in the intro as well, on top of promo pics of Shining Gundam and Full Armor Unicorn Gundam. We will update you on new suits as they are confirmed. Namco Bandai have released a new promotional video for the upcoming Gundam Extreme Versus Maxi Boost arcade game, due out on March 6, 2014 in Japan. The video showcases several new additions to the Maxi Boost roster such as Penelope Gundam, Hyperion Gundam, Gundam AGE-1, AGE-2, Gundam Astray Red Frame Kai, and Brave Commander Type. Other neat changes include God Gundam properly riding Fuunsaiki akin to the Mobile Armor modes of other units in the game. They also show off the EX Overdrive gameplay system which activates after certain conditions are met. The F-Drive boosts your melee prowess allowing you to guard break opponents and the S-Drive allows you to practically continuously fire off all your ranged attacks without having to worry about boost dash canceling. Make sure you check out the video below and see all the aforementioned changes to the latest sequel in the Extreme Versus series!